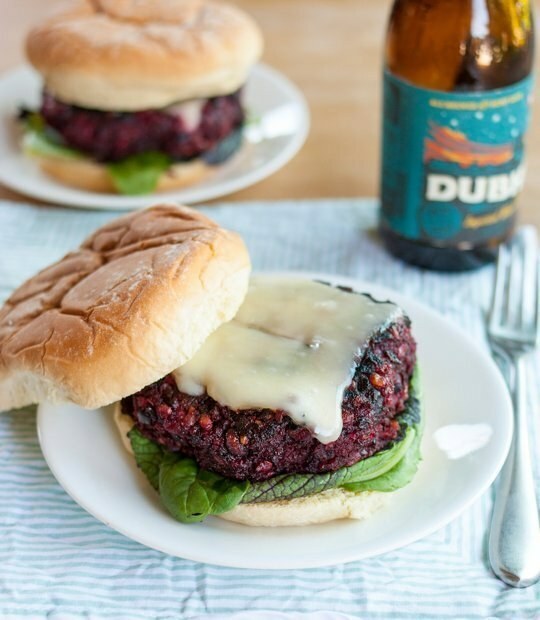 Whether I’m at a restaurant or a weekend barbecue, it always is such a bummer to get a veggie burger that’s little more than a dry, beige puck. There’s absolutely no reason these days the vegetarian option can’t be as flavorful, savory, and robust as its carnivorous counterpart — if not even more of a gastronomic delight. I found this recipe at The Kitchn and after trying it myself I had to share it with you all. Heat the oven to 400°F. Wrap the beets loosely in aluminum foil and roast until easily pierced with a fork, 50 to 60 minutes. Set aside to cool. Cook the rice while the beets roast: Meanwhile, bring a 2-quart pot of water to a boil. Salt the water generously and add the rice. Reduce the heat to a simmer and cook the rice until it’s a little beyond al dente. You want it a little over-cooked, but still firm (not completely mushy). This should take about 35 to 40 minutes. Drain the rice and set it aside to cool. Begin sautéing the onions when you’re done with the rice (or during, if you’re OK with multitasking! ): Heat a teaspoon of olive oil in a skillet over medium-high heat. Add the onions and a pinch of salt. Stir the onions every minute or two, and cook until they are golden and getting charred around the edges, 10 to 12 minutes. A few wisps of smoke as you are cooking are OK, but if it seems like the onions are burning, lower the heat. A dark, sticky crust should develop on the bottom of the pan. Drain and rinse one of the cans of beans and transfer the beans to the food processor. Scatter the prunes on top. Pulse in 1-second bursts just until the beans are roughly chopped — not so long that they become mush — 8 to 10 pulses. Transfer this mixture to a large mixing bowl. Drain and rinse the second can of beans and add these whole beans to the mixing bowl as well. 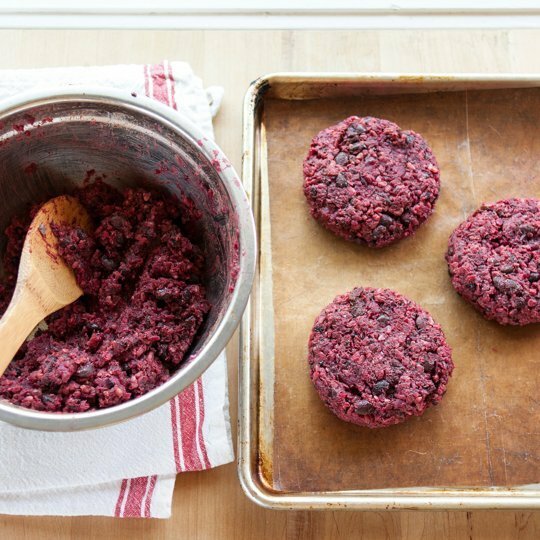 Combine the veggie burger mix: Transfer the squeezed beets, cooked rice, and sautéed onions to the bowl with the beans. Sprinkle the olive oil, brown mustard, 2 teaspoons of smoked paprika, cumin, coriander, and thyme over the top of the mixture. Mix all the ingredients until combined. Taste the mixture and add salt, pepper, or any additional spices or flavorings to taste. Finally, add the oatmeal flour and egg (if using — it helps hold everything together, but isn’t 100% necessary), and mix until you no longer see any dry oatmeal or egg. Refrigerate the burger mix 2 hours, or up to 3 days: Cover the bowl with plastic wrap or transfer the mixture to a refrigerator container, and refrigerate the burger mixture for at least 2 hours or (ideally) overnight. The mix can also be kept refrigerated for up to three days before cooking. Shape the burgers: When ready to cook the burgers, first shape them into burgers. Scoop up about a scant cup of the burger mixture and shape it between your palms into a thick patty the size of your hamburger buns. You should end up with 6 large patties. Transfer the patties to the pan. 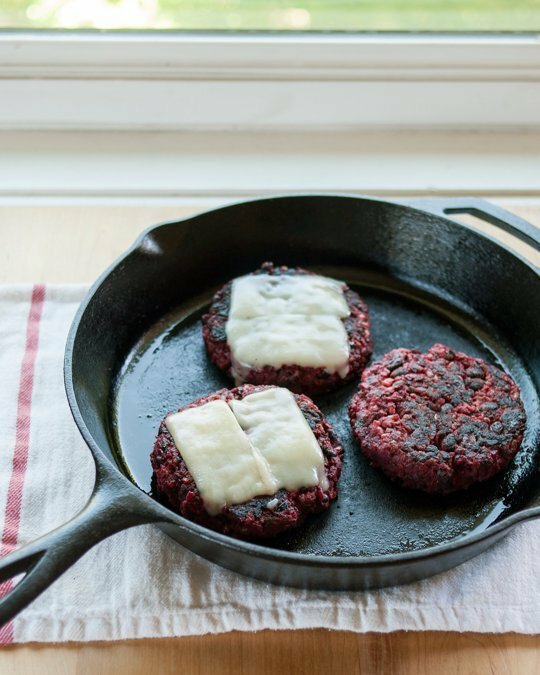 Cook as many as will fit without crowding; I normally cook 3 patties at a time in my 10-inch cast iron skillet. Cook the patties for 2 minutes, then flip them to the other side. You should see a nice crust on the cooked side. If any pieces break off when you flip the burgers, just pat them back into place with the spatula. Cook for another 2 minutes, then cover the pan and reduce the heat to medium-low. Cook for 4 more minutes until the patties are warmed through. 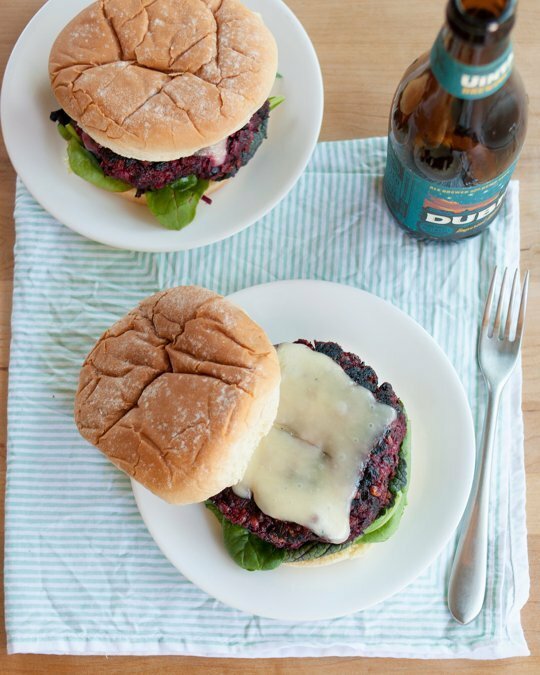 If you’re adding cheese, lay a slice over the burgers in the last minute of cooking. Grilling Burgers: While I haven’t had a chance to try grilling these burgers, they are firm enough to do well on a grill, particularly if you cook them in a grill pan or other device. You may also want to add an egg to the mix to help the burgers hold together better. Making Your Own Beans: Northstar makes their own black beans for their burgers. If you would like to do this, try cooking your beans with an onion, a clove or two of garlic, and some dried ancho or chipotle chile peppers for extra flavor.